It’s about two hours before taping the premiere episode of The Zoomer — the new 60-minute current events and lifestyle show that Black co-hosts with former MuchMusic producer Denise Donlon. It airs every Monday night on Vision TV. But the filming is just one thing on his day’s to-do list. After this I have to give a speech to a room full of lawyers at Osgoode Hall,” he explains as we start talking. Intimidating room?” I ask jokingly. “They don’t intimidate me,” he shoots back with his trademark steely confidence. His confidence seems to falter slightly, though, when I ask him if he is excited about The Zoomer. The majority of the show is built around a series of panel discussions, led by Black and Donlon. They are joined by guest hosts such as Ronnie Hawkins and regular contributors like journalist Libby Znaimer and Susan Eng (VP of advocacy for CARP). Topics are geared toward an older demographic — medical marijuana use, living beyond 100, doctor-assisted suicide — but are broadly accessible. Black has two segments of his own, one in which he talks head-to-head with influencers like Brian Mulroney and Margaret Atwood. The other, Talk Black, is a short editorial where he sounds off about any number of subjects (the first one is about the U.S. justice system). I watch the taping take place after my chat with Black. The pace is quick and the conversations engaging (hopefully Ronnie Hawkins comes back — he’s 78 but a total rascal). Regardless, the likelihood of a large viewership is high. Black is, after all, “Canada’s most famous non-citizen” (as deemed by a 2007 Vanity Fair profile). And audiences will, undoubtedly, be dying to see if he still has the same wit and vigour that propelled him to become one of the world’s biggest press barons (and to see if he’s rebounded from his notorious fall from grace). He bought his first tabloid for $500 in his early 20s, Quebec’s Eastern Townships Advertiser. By his mid-50s, as the head of Hollinger International, he owned over 500 broadsheets, including London’s prestigious Telegraph and the Chicago Sun-Times. His social circle included the likes of Princess Diana, Margaret Thatcher and Henry Kissinger (with whom he’s chummy again after a brief falling out). He even became a British lord in 2001, a peerage for which he gave up his Canadian citizenship (then–prime minister Jean Chrétien said he couldn’t have both). Black’s subsequent dethronement is schadenfreude served cold. In July 2007, he was sentenced to six and a half years in a Florida prison on charges of fraud and obstruction of justice. He was released early, in May 2012, after serving a total of 37 months. Most of the charges were thrown out after a Supreme Court appeal, and he got time off for good behaviour (he tutored fellow inmates in English). He has always maintained that he was wrongfully accused. Although he’s no longer a citizen, he is allowed to live in Canada on a temporary resident permit (TRP). He currently resides in the Bridle Path mansion where he spent much of his childhood. Presently, he says he’s “happy for a somewhat simpler life.” He’s always been a night owl. He usually works until about 3 a.m. and doesn’t get up until 10 a.m. He works mainly from home. His place has a massive library, spread over two, double-height rooms, with upwards of 20,000 books. Starting during his time in prison, he’s become a prolific columnist, contributing regularly to the National Post newspaper (which he launched in 1998) and the Huffington Post online, among other outlets. (“I have over four million readers a week,” he notes proudly). In May he released Flight of the Eagle: A Strategic History of the United States, a 768-page tome on American exceptionalism (despite being incarcerated by the U.S., he’s still fascinated: “It’s a tremendously important and influential country,” he explains). The new TV show also keeps him occupied, as have speaking engagements. Although he notes that “the social life [in Toronto] isn’t what it was in London or New York,” he does go out a couple of times a week and entertains visitors from abroad. For their 20th anniversary in 2012, he and Amiel went to Noce on Queen West. Part of what motivates Black to rebuild and rebrand his image is a lingering sense of anger about having been imprisoned. But then he continues more deeply: “We have a very high compatibility. It was hard on her, too. But she visited me every week. Even when she came back from the Olympics in Beijing. This article originally appeared in the November, 2013 issue of Post City magazine. 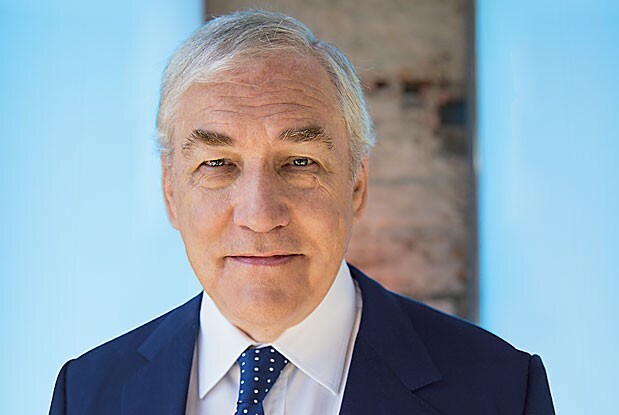 This entry was posted in On the Media and tagged Conrad Black, Post City, Toronto, VisionTV, Zoomer by mmhague. Bookmark the permalink.